Last year, I found myself diving with an SAR (search and rescue) officer and somehow the subject of retirement came up. Damn, I want that job!!! 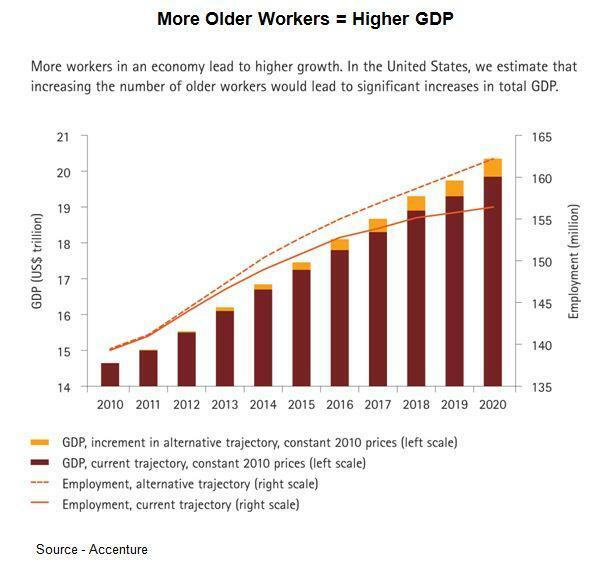 But the hard business and personal fact is we’re facing a global retirement crisis for workers of all ages and in every industry. According to the OECD (Organisation for Economic Co-operation and Development), 18 percent of the workforce could retire within the next five years, taking with them precious industry knowledge/expertise and overburdening government/company retirement plans they simply cannot afford. According to the OECD, the average man in 30 countries will live 19 years after retirement. That's up from 13 years in 1958, when countries and companies developed generous pension plans. It’s a global fiscal issue … it’s a personal self-worth issue … it’s a business issue. It all started years before the Great Recession and the 2008 financial meltdown. The idea of a leisurely retirement began in 1889 when Germany introduced a state pension system; and in the good times, countries and businesses began offering defined benefits pensions. Growing, Older – The world’s population is not only growing, it’s getting older. 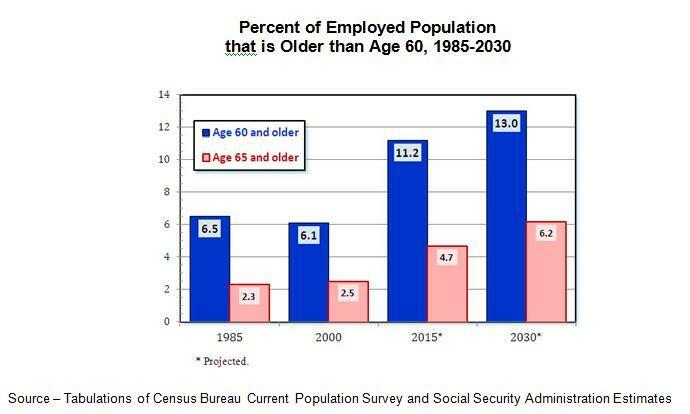 If all of the 65+ year-olds were to retire, they would create an unbelievable burden on retirement funds and governments around the globe. The problem is people started living longer and birthrates dropped. It has only been in recent years that China saw the writing on the wall and abandoned their one child mandate. 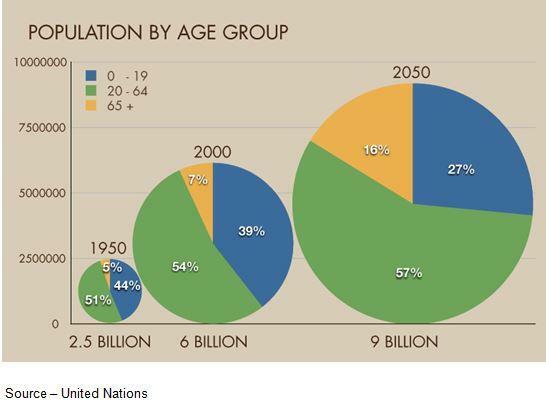 The global population is now aging … rapidly. According to the OECD, governments pay 59 percent of a retiree’s income; so it doesn’t take an engineer to see that most government budgets are in a world of hurts. One solution for governments to increase their incomes is to make it easier for people to work longer. Some say doing that penalizes younger potential workers and their futures. But when women started working outside the home, men weren’t put out of work, nor were their earnings reduced. Instead, as the workforce grew, so did the demand for more goods, services and the economic pie got bigger. A study by MIT and University of British Columbia found Boomer employment didn’t impact younger worker employment or earnings. Bank on It – While some claim older productive workers are depriving newcomers of opportunities, the fact is they actually create more opportunities for companies, newcomers and the overall economy. A study by Accenture found working boomers actually contributed more by paying taxes and buying more stuff. Since 2007, the prime working age population in industrialized countries has fallen 1.2 percent while the Boomer population has increased 20.2 percent. Because they tend to live longer and stay healthier longer, there is also a growing number who want to work longer, even if on a modified schedule. According to many Boomers, there are reasons to continue working such as practical family needs. The high costs of higher education and housing have meant many parents are providing financial assistance to their children. The work/life change is even taking place in countries such as China and Korea where children traditionally took care of their parents. Today, the younger generations begin their careers in other cities and other countries, leaving their parents behind. Parents don’t expect their struggling children to support them as they did their parents. But the reasons many want to keep working can go beyond any financial need. Often, they are expressions of a need to contribute, fulfillment and/or goal achievement. These needs are important for the CE, computing, communications industry because most techies actually like what they do and are driven to develop new technologies, expand the applications/horizons, challenge themselves and those around them. Each new generation entering the industry approaches his/her career different from the one(s) that follow. As for Boomers, they may want to keep intellectually involved, just not full time. Retaining that knowledge/expertise for the technology industry is vital. We are constantly racing to implement leading-edge solutions while legacy systems still run critical applications. In most instances, upgrades and new technologies are more effective if the team understands how the legacy technology works and how businesses and consumers were using it. For example, successfully transitioning from legacy platforms to the Cloud requires Boomers, Gen Xers, Gen Yers – people who know the legacy, people who see how tomorrow will work and people in the middle who are the glue to making the transformation a success. At the same time; governments, financial institutions, businesses of every shape/size will probably continue to run key activities on mainframes for many years to come. As one industry analyst noted, not everything is smartphone/tablet-driven. There are still a lot of Windows NT servers and 1955 machines in use today. Disregarding the financial “burden” issue, companies needs 50 to 60-year-old engineers working alongside 20 to 30 year-olds, even though work styles and use of technology vary. How do they keep experienced senior employees who are eyeing retirement? How do they recruit talented young workers? How do they keep older workers current on technology? How do they train young workers so they are prepared for increasingly complex tasks? But by working at achieving generational diversity, the industry can enhance its most valuable asset – people – instead of letting the conflict fester and grow. A number of firms are actually seeking out older workers--even if their experience isn’t directly related--because after they have invest in their development, they tend to stay much longer than recent graduates. Many want to/need to work longer. But for them, working vs. retirement isn’t a complicated question.